At least four prisoners were injured in a violent crackdown by prison authorities in the jail’s Roe House on Monday, following the deployment of the prison’s riot squad on Sunday. Mr Kelly said he has been in terrible pain since the assault, suffering a suspected broken arm and head injuries. He has cuts to his face, including a gash held together with temporary stitches. Prison medics have said said there is a large lump on the back of his head caused by a dangerous build-up of fluid at the base of his skull. Mr Kelly was denied access to an outside hospital unless he submitted to a humiliating strip-search strip-search by the riot squad. He refused, and says he will continue to refuse. A second prisoner, Christy O’Kane from Derry, described his medical treatment for his injury as “shambolic and non-existent”. His lawyer, Ciaran Shiels, protested at being refused access to his client. “I’m aware of at least four prisoners who have alleged that they have been assaulted and the injuries that one prisoner has suffered, which include a broken arm and lacerations to his face, are in fact consistent to grievous bodily harm,” he said. Prison Service director general Sue McAllister was accused of engaging in a cover-up after she denied any injuries had resulted from the confrontations, which followed intermittent lockdowns of the prisoners in their cells since last week. It is understood a tense situation at the jail had been greatly exacerbated by the erection of new physical structures aimed at further restricting the movement of republican prisoners. Corridors and doorways leading from our landings into areas such as the canteen and yard had been replaced by what prisoners described as “obstacle courses” of turnstiles and steel doors. “Steel birdcages have been erected to cage us like animals in certain areas of the landing,” they said in a statement. “Following protestations from Republican Political Prisoners, the jail administration responded belligerently by covering the birdcages with darkened perspex and sheets of wood. The vast majority of the republicans at Maghaberry are being held indefinitely on remand awaiting trial, a form of internment. 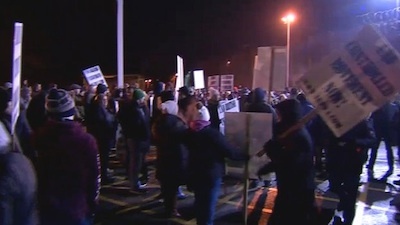 Several hundred family members and supporters gathered for an impromptu protest outside the jail (pictured) as reports of the assault spread on Monday. Prison authorities responded by refusing prison visits for 24 hours until the area had been checked for potential explosives. There was also a solidarity protest by prisoners at Portlaoise jail in the Irish midlands on Wednesday. eirigi expressed concern at what they said was “a pressure cooker situation” created by the continued refusal of the prison administration in the Six Counties to fully implement a 2010 deal on prison conditions. “That situation has been recently compounded by the unnecessary actions of the authorities in introducing additional and completely unwarranted physical structures aimed at restricting the movement of Republican prisoners even further,” they said. Harry Fitzsimmons, a spokesman for Roe Four prisoners, called for the 2010 deal to be implemented and an end to the controlled movement of the prisoners. He said republicans do not want control of their wing, as depicted in the mainstream media. “It is important to point out that republican prisoners are not calling for prison staff to be removed from our landings. What we are asking for is the ability to move freely on the landing,” he said. Prison Service officials had refused to formally meet with prisoners to discuss the impasse, he added. “We want a conflict free environment. We don’t want a repeat of what happened in here on Monday,” he said. “We have asked the prison governor and other governors to meet us formally to discuss this and they have refused.